We’ve had the camper a couple of weeks now. It’s more wonderful than I imagined. Four Wheel Campers have evolved into really clever, efficient small living spaces. The company has been in business for more than 40 years and they have listened to customers, taken their suggestions and come up with innovations of their own. The result is a very smart design and execution and, consequently, a very comfortable, tiny space. The Isotherm frig is surprisingly big. Eighty liters is a lot of space. Our plan is to do the complicated cooking at home and then pack several days of dinners into the frig before we go. We haven’t use the freezer yet but, according to the manual, it’s not really a freezer but just a colder part of the refrigerator. I guess no Haagen Daz in the wilderness after dinner. One thing to keep in mind, something we found out the hard way, is that the camper really off gases when it’s new. The vinyl siding and the cushions off gas so much that we found it unusable for the first four days we had it. My plan was to sleep in it the first night. However, when I started working to get it ready, I realized the smell was so strong that I couldn’t even stay in it to set up the bed. To speed up the process of getting the smell out of the camper, we removed all of the cushions and left them in the backyard to air out. Then we opened all the windows and the vent/fan in the camper and left the door open during the day. After four days, the smell was gone. I’m only glad we weren’t planning a trip for the day we picked it up. We would have ended up in a motel someplace. The only other issue we had was figuring out what to use for stairs. We wanted something light and effective and hoped whatever we chose would be good for our elderly dog. We ended up compromising because we couldn’t find a single solution. 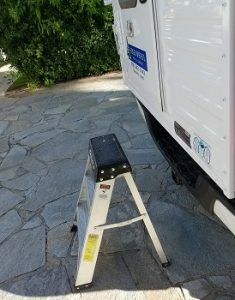 We lift the dog into the camper and use a three step aluminum ladder for us. The ladder is the perfect solution because it’s extremely light weight, reasonably priced and compact . On Tuesday, i bought a new Toyota Tacoma TRD Off Road truck. It wasn’t easy to find. I checked a number of dealers in California but from every one of them I got the same story. We have no Toyota Tacoma TRD Off Road trucks on the lot and we aren’t getting them in any time soon. Some dealerships said they were getting one in next month but it was already spoken for. Not only that but the prices were jacked up a few thousand over the MSRP. And I had to take what they got it, no choice of color or options unless I wanted to special order one and wait months for it. So I skipped the California Toyota dealers and started looking in Washington. I started at the top of the state and worked my way south from dealership to dealership. When I called Magic Toyota in Edmonds, Washington, they said they had a white one on the lot, fully loaded and they were selling it for the MSRP. They sent the specs and I bought it on the spot. No sense waiting now that I’ve decided that’s what I want to get. I have to pick it up in Washington and drive it to Southern California to register it with the DMV within 30 days. And today, I bought a Four Wheel Camper, the Fleet model that fits the Toyota Tacoma. I got the solar panels, the extra battery, the 80 L frig, sink, hot water and two burner stove. I also got an awning, front dinette and airbags. I never get all the options but this time I did because I’ve waited so long to get the camper that I don’t then want to have to find someone to modify it. What I ordered will be ready to get on the road as soon as it’s installed on the truck. The camper will be ready in the middle of November. This entry was posted in Decisions on August 20, 2016 by admin@etopia.com. Whenever I’ve thought about having a camper in the past, I’ve always thought about putting it on a Toyota. I’ve had experience with Toyota trucks and their reliability and figured that was the way to go. The limitation of Toyota Tacomas is that they are small and can only accommodate a small camper. However, when I met Mike at VMI Offroad at the NW Offroad Rally, he introduced me to the idea of getting a bigger truck and a bigger camper. He explained that if you want to live in a camper, bigger is better. He explained that the best camper truck, for all around versatility, reliability, longevity and power was a Ram 2500 or 3500 with a Cummins diesel engine. The Cummins engine is supposed to be good for 1,000,000 miles. I liked the idea of a Cummins engine, a name familiar to me from growing up in the argicultural Central Valley of California. And I loved the idea of an engine good for a million miles. That’s my idea of reliability. What worried me, however, is that a Ram is a big truck and I’m a small person and I wondered if I’d be comfortable driving something that big. So last Sunday, I called the local Dodge dealer to see if they had a Ram 3500 truck I could test drive. I talked to Bunny, an enthusiastic and knowledgeable Sikh. He said he had a 3500 Diesel that I could drive and I said I’d be down in an hour. When I got to the dealership, a large, all black Ram 3500 was sitting out front, ramping and ready to go. Bunny, sporting a beautifully wrapped blue turban, was waiting with the truck. We exchanged introductions, I gave him my drivers license and we were off. As we drove, he explained the features of the truck: the engine, the onboard technology, the safety features, the comforts. I paid half attention to him and half to feeling the drive which I found very comfortable. I was surprised how easy the truck was to drive, except for the fact that it was difficult to gauge just where the truck ended and other objects began. He said a back up camera was standard and a front end camera was optional. This entry was posted in Decisions on August 10, 2016 by admin@etopia.com. Today I had a long conversation with a friend who owns a Four Wheel Camper and he spent over an hour telling me about his camper and what he’s done to it. He bought the shell and then had them add a stove, heater, propane tanks, awning, wiring for solar and a fan. He doesn’t have a built in table and chairs, preferring instead to use tiny stadium chairs and a small table that can be set up either inside or outside. And he uses an ice chest for his refrigeration. No indoor plumbing. He’s refined the design by adding hooks, boxes, storage containers and a mattress topper. The set up works perfectly for him and he said that he’s spent at least 100 days camping in the last three years and thinks he has everything just the way he wants it. Talking to him made me waffle for a while. 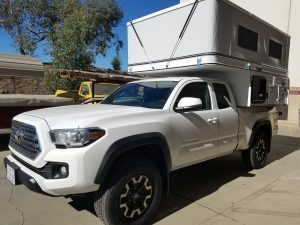 I was back to option two, a Four Wheel Camper on the Toyota Tacoma we have now. This is the least expensive, least risky solution and we can figure out how much we like being on the road and what we’ll need to be comfortable. It’s surprising how personal all these choices are. Each couple, each person lives uniquely and while you can say what works for you, your preferences simply don’t translate to another person. This entry was posted in Decisions on August 8, 2016 by admin@etopia.com. I am in the process of choosing and buying a camper so I can hit the road, hopefully for half the year or more. A very long time ago, I spent the summers in a camper in Alaska. I still associate that time with adventure and not many mundane responsibilities, and I’m hoping to recapture that feeling and improve the experience the second time around. Right now, I’m settled on #7 and think that’s what I’ll get but the die isn’t cast so things can still change. This entry was posted in Decisions on August 6, 2016 by admin@etopia.com.